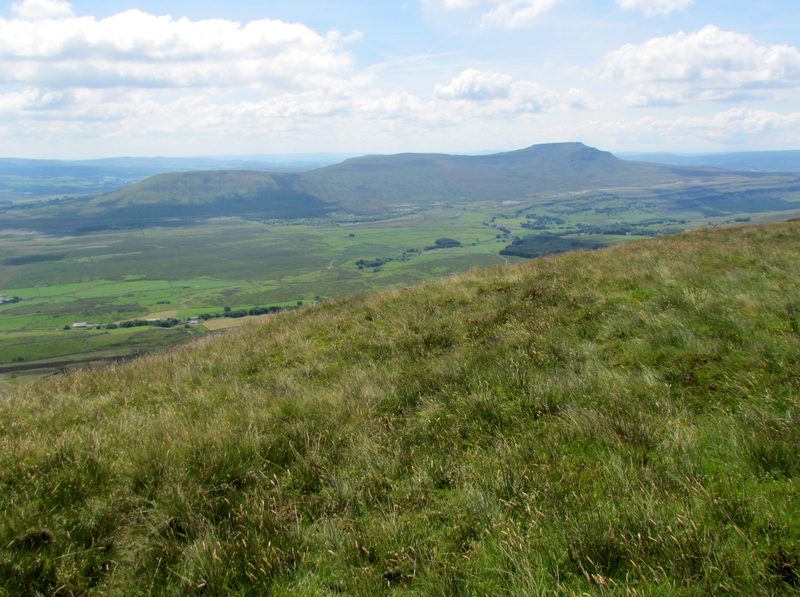 Ingleborough is the second highest hill in the Yorkshire Dales, and one of the Yorkshire Three Peaks. it has a distinctive appearance, consisting of horizontal layers of limestone, interspersed with gritstone. These layers of limestone were laid down in the Carboniferous period (340 – 300 million years ago), when Yorkshire was covered with a warm and shallow sea. The limestone consists of the fossilised remains of tiny sea-creatures whose skeletal remains sank to the bottom of this sea. When the climate cooled, as happened a couple of times during the Carboniferous period, sea levels fell, and the area became delta-like, allowing rivers to cover the limestone with sandstone and gritstone. Erosion of the different types of stone has occurred at different speeds, giving the step-like appearance to the hill. 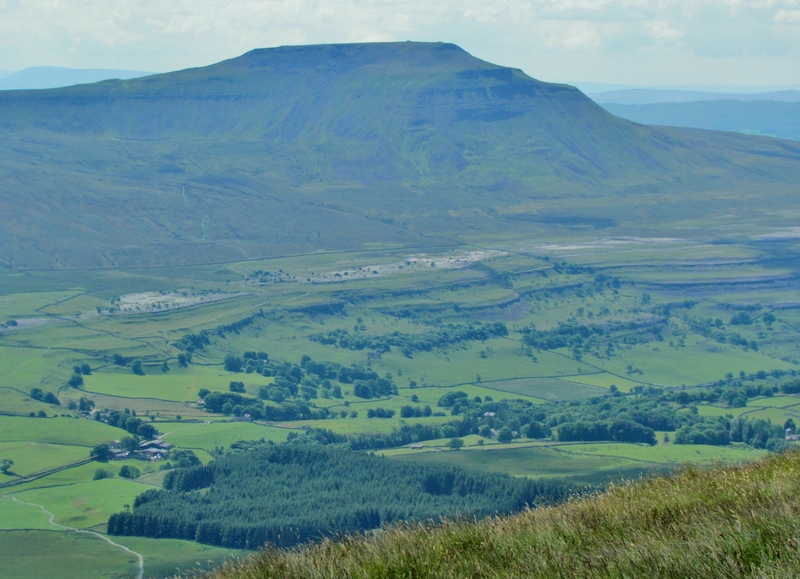 Ingleborough has an iconic profile, when viewed from nearby Whernside or from Ribblehead. It is most usually climbed from Ingleton (4 miles), Clapham (5½ miles), or Chapel-le-Dale (3 miles). 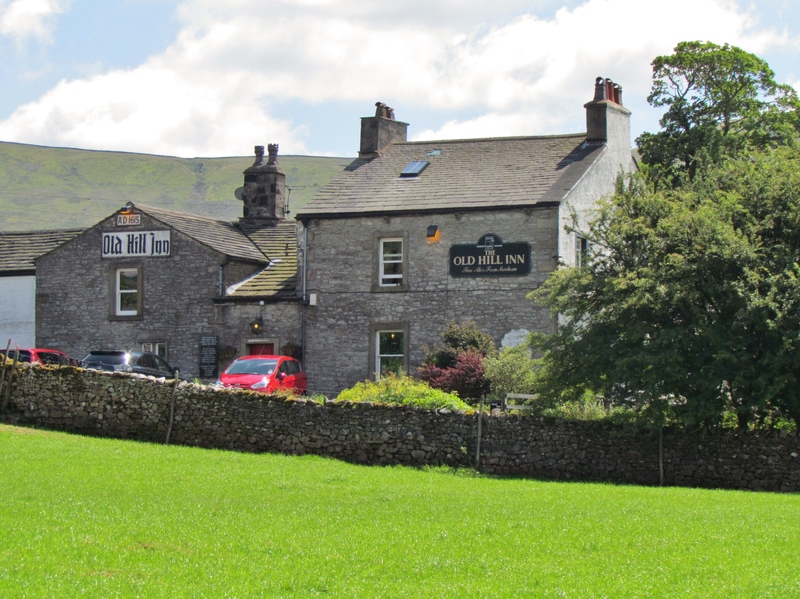 Refreshments are available at all four villages of Clapham (New Inn), Ingleton (Wheatsheaf or Craven heifer), Ribblehead (Station Inn), and Chapel-le-Dale (Old Hill Inn). Whernside is the highest hill in North Yorkshire, and lies on the border with Cumbria. 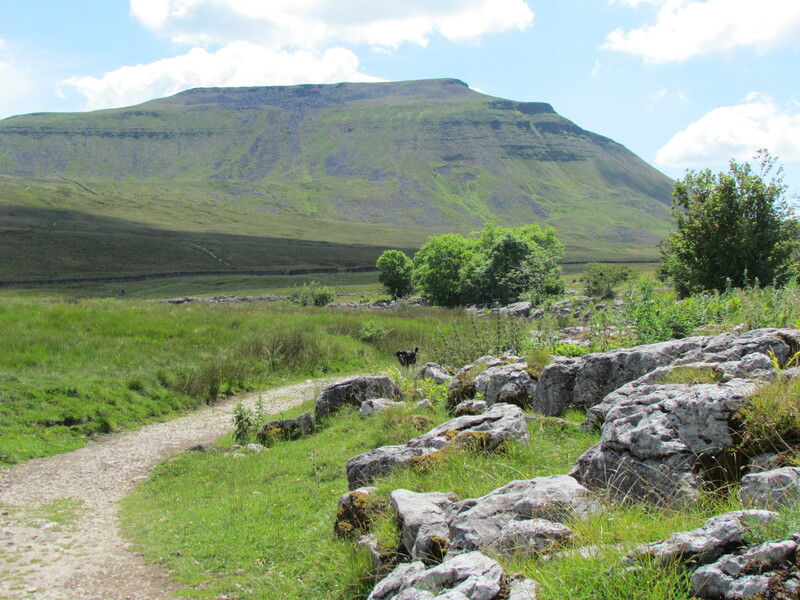 It is also one of the Yorkshire Three Peaks (usually the second to be walked). It is most commonly ascended from Ribblehead Viaduct, which lies 2½ miles to the south-west. 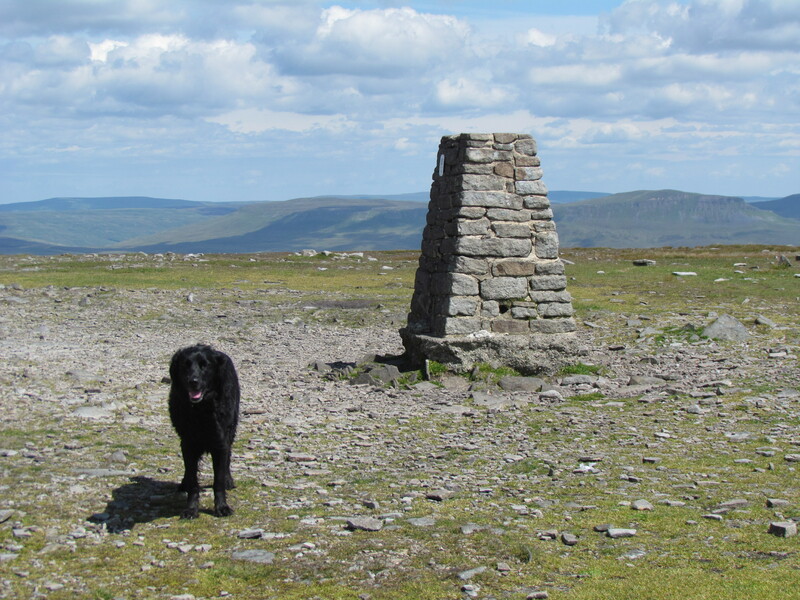 In common with many limestone hills in this area, the summit of Whernside consists of a long plateau, running from north to south. 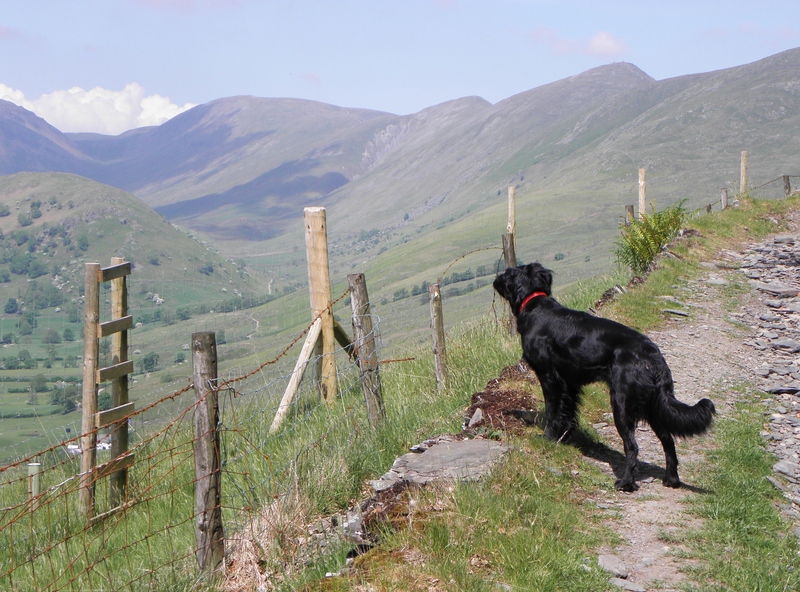 There are excellent views towards the Lakeland hills, and the west coast. On a clear day, with binoculars, Blackpool Tower can be seen. 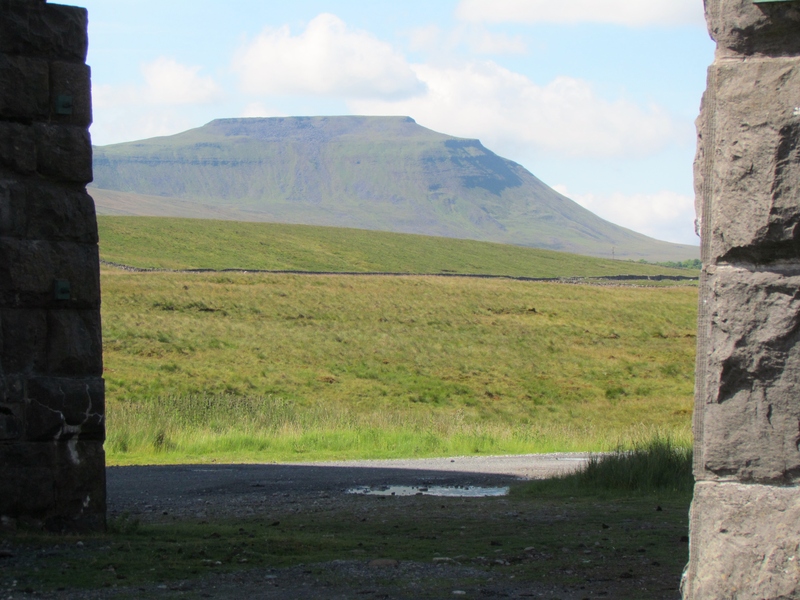 Nearby, there is an excellent view of Ingleborough. 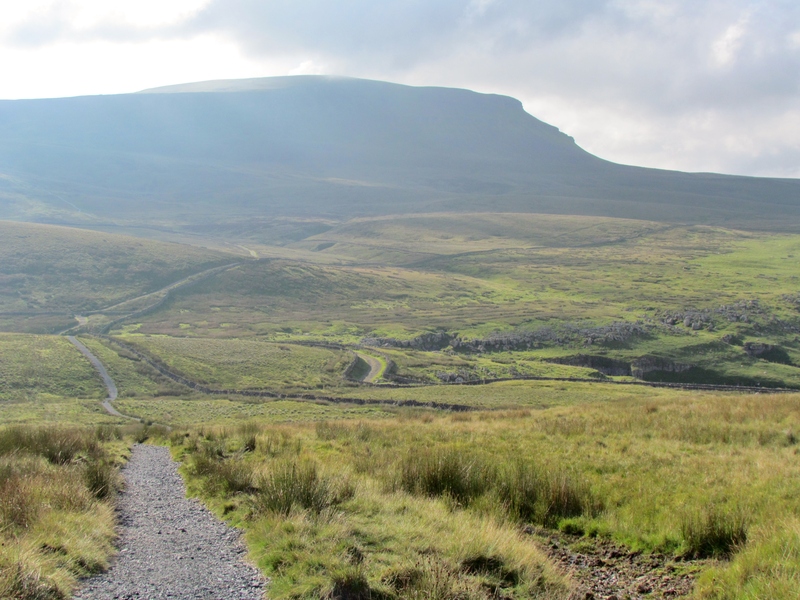 The usual route of the Three Peaks would see Whernside ascended from Ribblehead, and descended south to Bruntscar and Chapel-le-Dale. 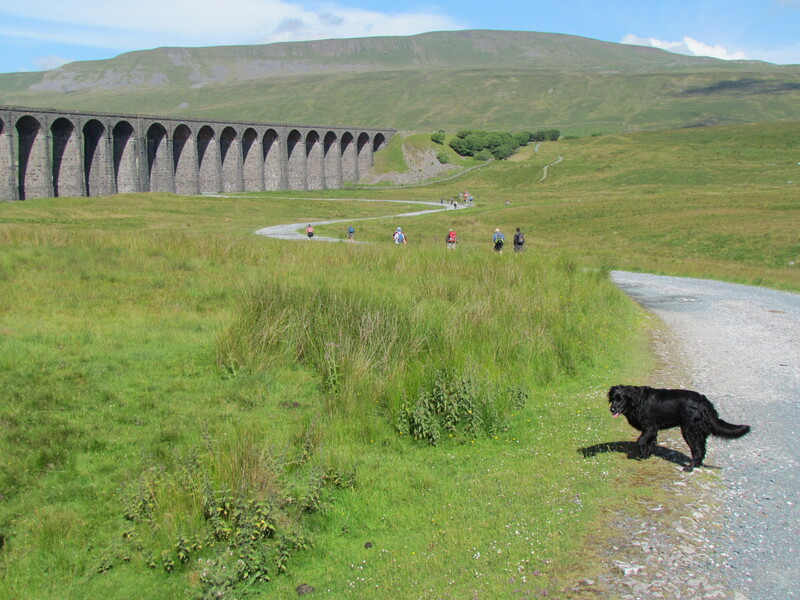 The ascent from Ribblehead is about six miles, while from Chapel-le-Dale the ascent is about four miles. 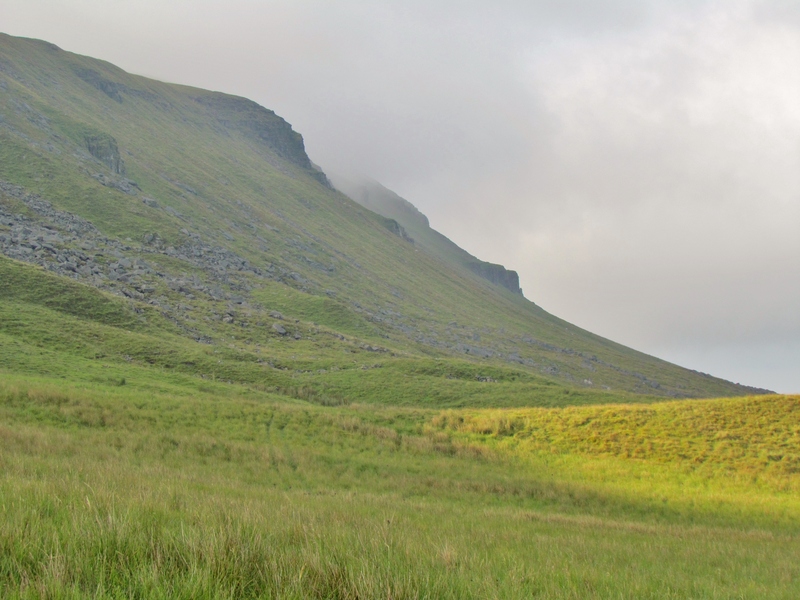 A circular route linking the two routes via Haws Gill Wheel would provide a splendid ten-mile walk, with refreshments available at the Station Inn at Ribblehead and the Old Hill Inn at Chapel-le-Dale. 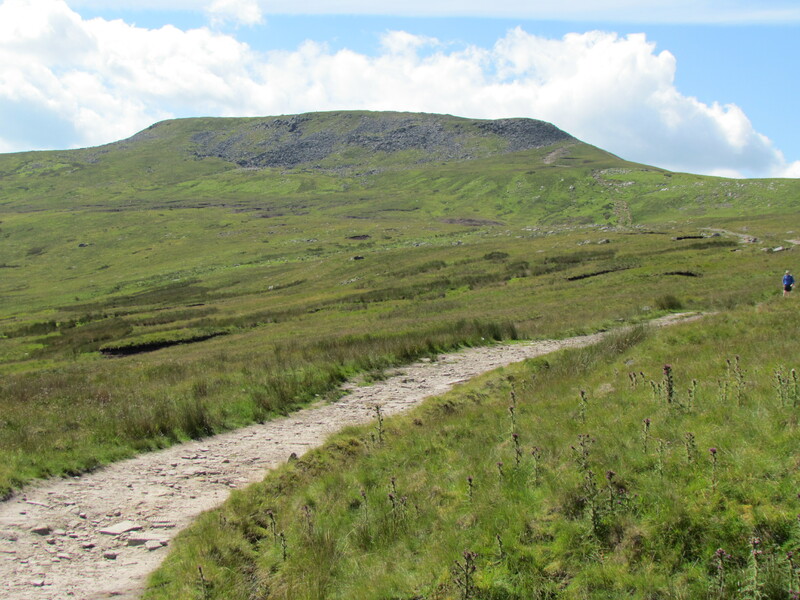 As Whernside is situated within access land, it is possible to ascend and descend by numerous smaller paths. 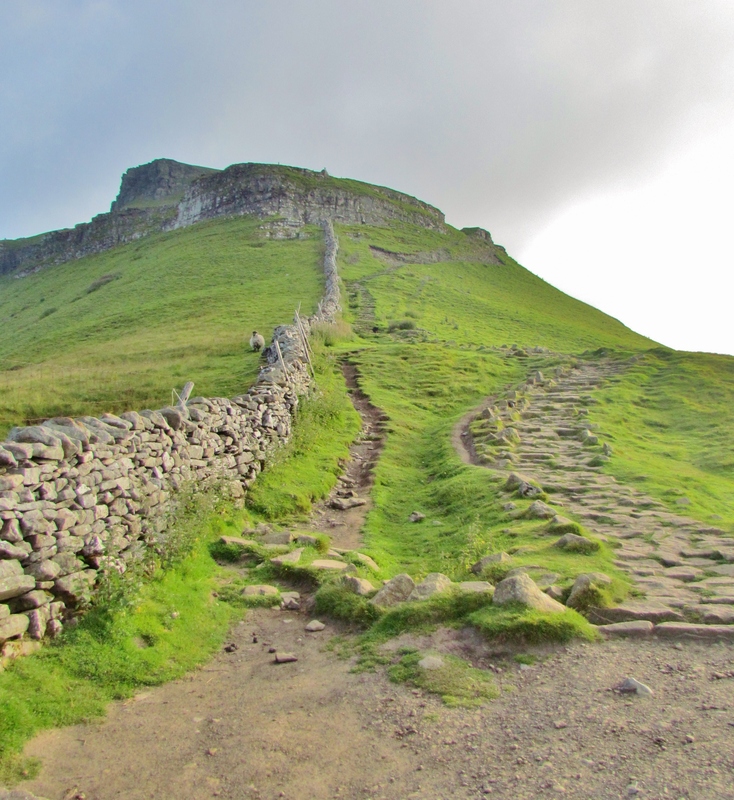 Pen-y-ghent is frequently walked for two reasons: it is one of the Three Peaks of Yorkshire (usually the first to be climbed), and it lies on the Pennine Way. It’s distinct profile makes it easily recognisable from a distance. 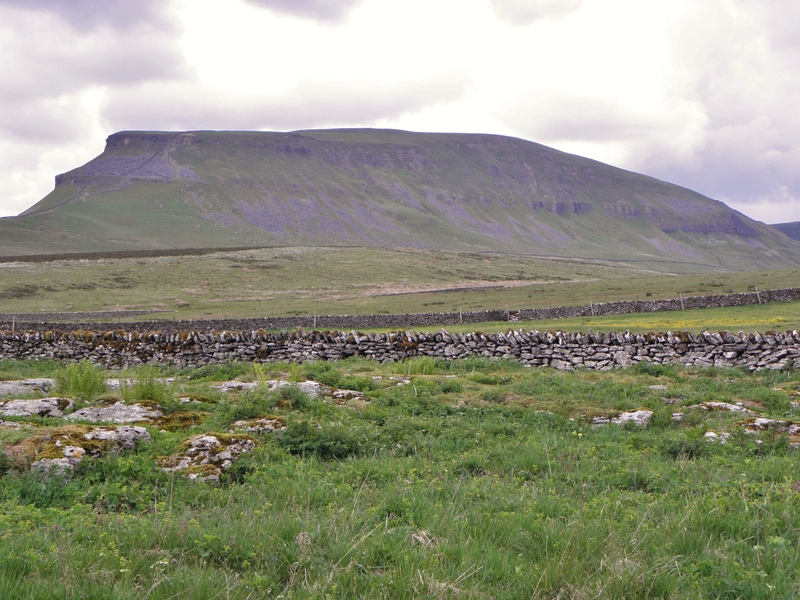 Pen-y-ghent is topped by a long plateau, running from north to south, which is reached by a satisfying-steep final climb. 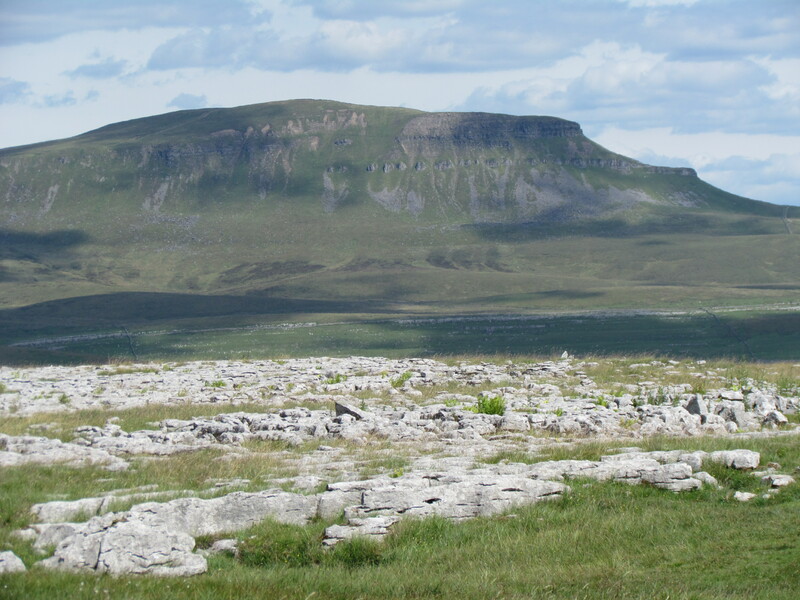 The distinctive shape of pen-y-ghent derives from the two thick horizontal layers of limestone, which have eroded more slowly than the sandstone layers between them. These beds of limestone were formed from the fossilised remains of small crustaceans. These creatures lived in a warm shallow sea that covered Yorkshire around 340 million years ago (during the Carboniferous period). The climate cooled around 320 million years ago, and again around 300 million years ago. During these two periods of cooling, the sea retreated and the area became more delta-like, and flowing rivers brought the gritstone and sandstone which form the intermediate layers in the hill today. 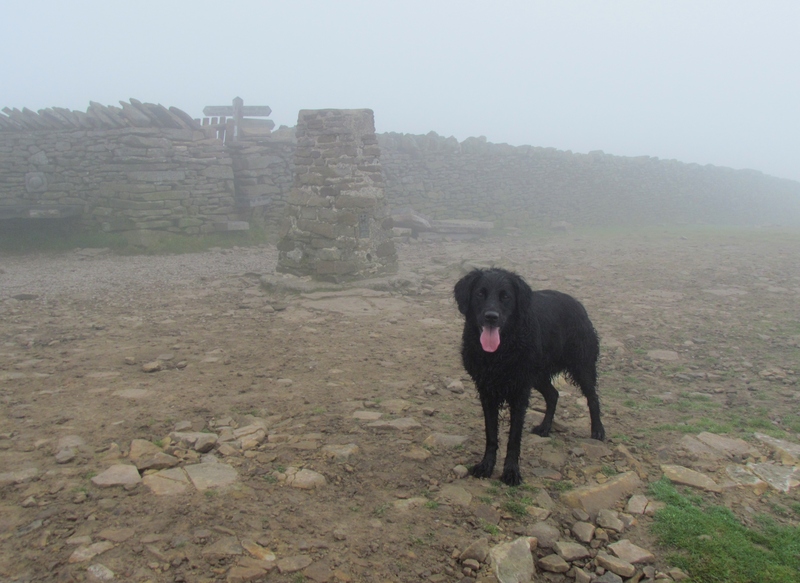 The summit of Pen-y-ghent consists mainly of gritstone. The name of Pen-y-ghent probably derives from the Cambric language which was spoken in northern England and southern Scotland in the early Middle Ages, becoming extinct around the twelfth century. Pen means top, and ghent is thought to mean border. Thus Pen-y-ghent is the hill on the border. We do not know to what border this refers. 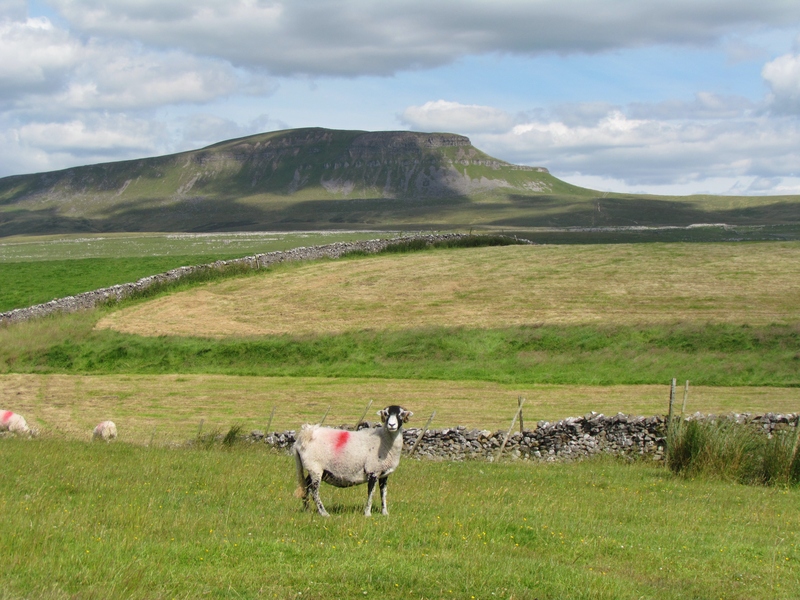 Pen-y-ghent lies about 2½ miles west of Horton-in-Ribblesdale, and is most frequently walked from there. There are two main routes from the village. The first is by leaving the village to the south and taking a minor road to Brackenbottom, from where a footpath ascends the eastern face of the hill. 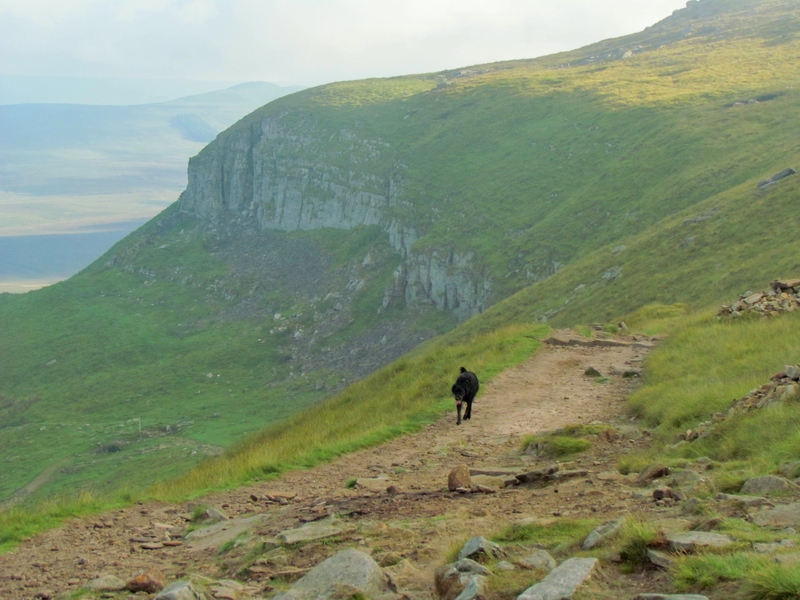 This route is the shortest, and the one usually followed when walking the Three Peaks. The second route is to leave Horton-in-Ribblesdale via a lane from the in the centre of the village. This is the route of the Pennine Way, and approaches the hill from the north. Combining the two routes above gives the possibility of an excellent six-mile circular route. 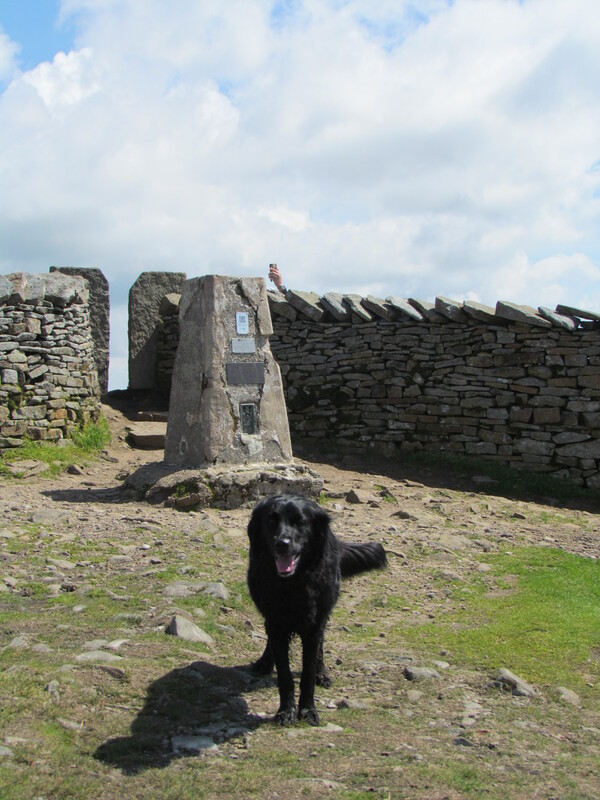 A slightly longer circular route can be had by following the Pennine Way a little further to the south of the summit, as far as Churn Milk Hole. In the photo above, Froswick is the nearest hill. Behind it lies Ill Bell which, at 757m, is nearly 40 metres taller. Behind Ill Bell, a little to the right, is Yoke (a little shorter at 706m). 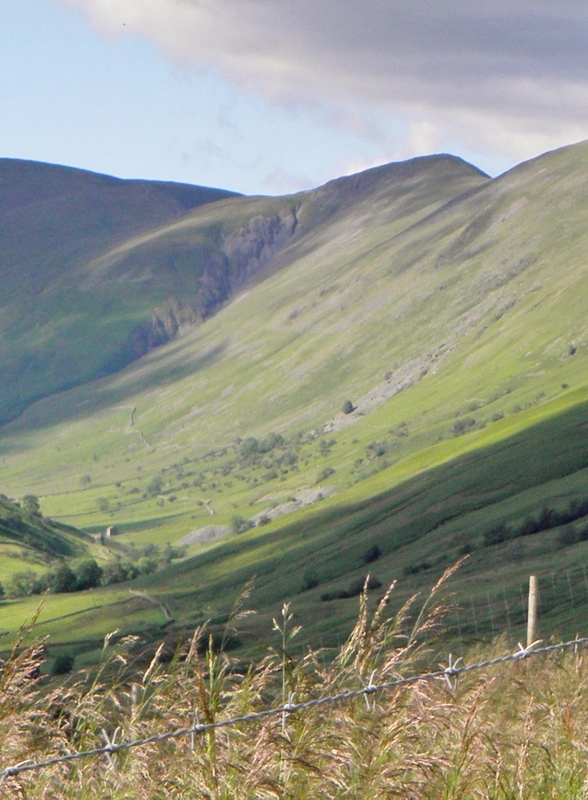 All three of these fells are overshadowed by Thornthwaite Crag (from where the photo is taken) at 784m. However, as so often in the hills, the sum is greater than the parts. Individual heights are less important than the cumulative effect that each summit makes to this splendid ridge – Thornthwaite Crag, Froswick, Ill Bell, and Yoke. Yet each fell also maintains its own distinctiveness, and deserves to be considered separately. Froswick takes its pattern from Ill Bell . . . almost humorously seeming to ape its bigger neighbour. The summit plateau of Froswick is modest, although the final climb to it is satisfyingly steep. 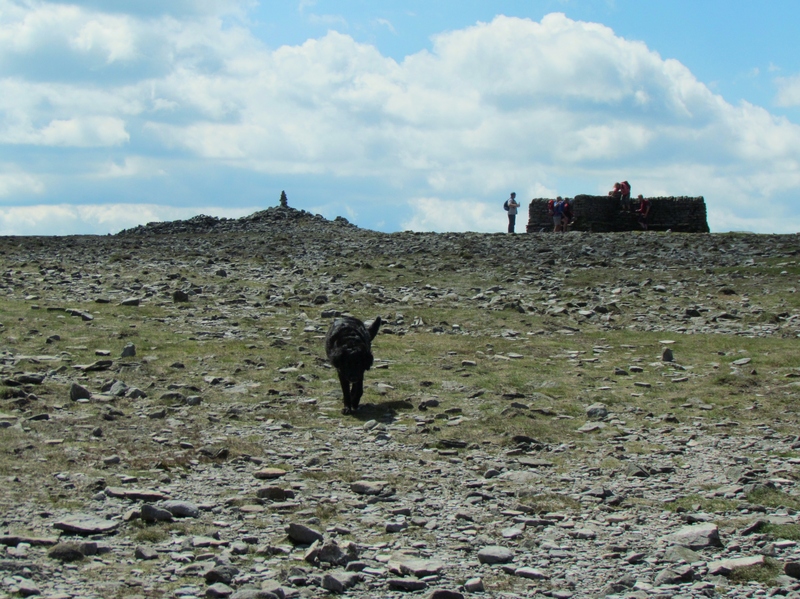 The summit probably doesn’t get appreciated as much as it might, as walkers are invariably looking to Ill Bell or – if coming from Yoke – to the long path to Thornthwaite Crag. Descending directly from Froswick is rarely attempted, although would be feasible on the western side if care is taken to avoid the gully of Blue Gill. 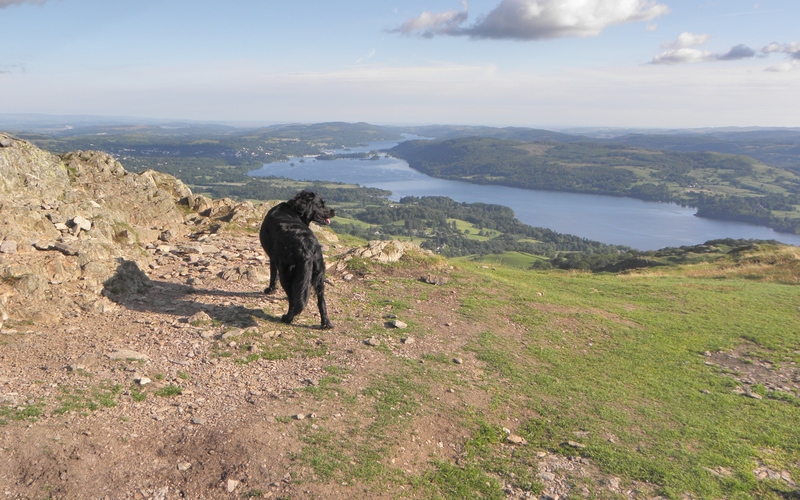 Chances are, most people you meet crossing the summit of Froswick will be walking the Kentmere Horseshoe. 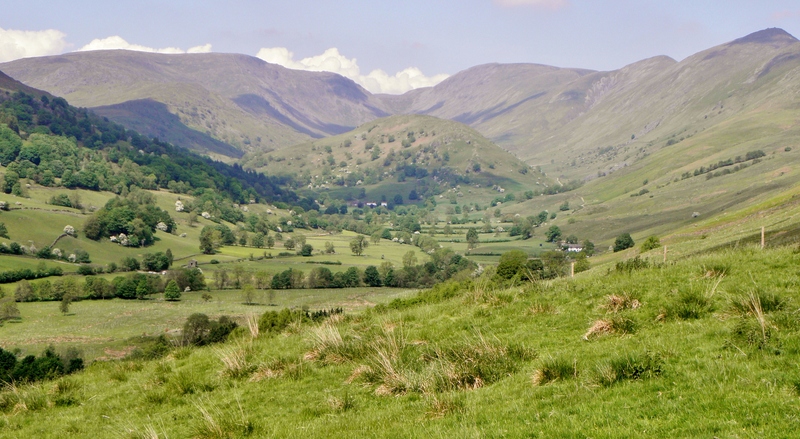 This is a classic Lakeland walk, a twelve-mile circuit starting from the village of Kentmere. It encompasses the Yoke, Ill Bell, Froswick, Thornthwaite Crag ridge, returning along the eastern side of the Kentmere valley, and taking in Mardale Ill Bell, Harter Fell, Kentmere Pike, and Shipman Knotts. 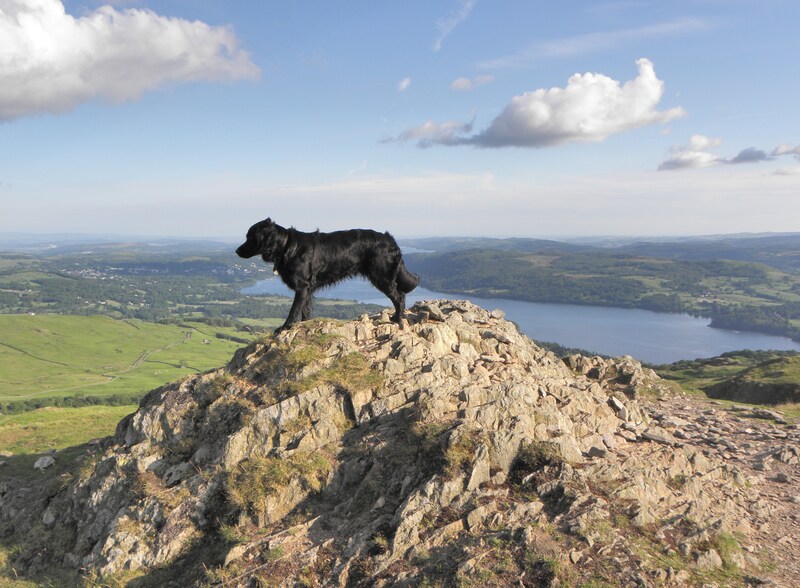 An alternative is to complete the initial ridge and then head west, returning via Stony Cove Pike, St Raven’s Edge, Red Screes, and Wansfell Pike. This is a slightly longer route, and not such a neat horseshoe as the Kentmere route. It does, though, include a great ascent of Red Screes from Kirkstone Pass, and allows a variety of starting points. 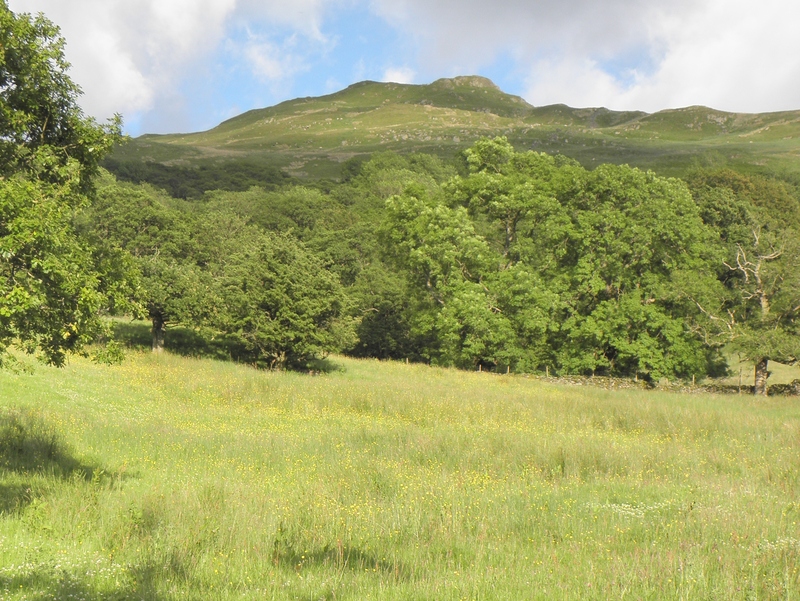 The fells surrounding Troutbeck are displayed in the photo below. From right to left, we have Caudale Moor, Stony Cove Pike, Thornthwaite Crag, Froswick, and Ill Bell. Yoke is just off to the right. The smaller hill in the middle is The Tongue. A third alternative would be to start from the car park at Mardale Head, reaching Thonthwaite Crag and Froswick via High Street. The climb up Riggindale Crag to High Street is superb. 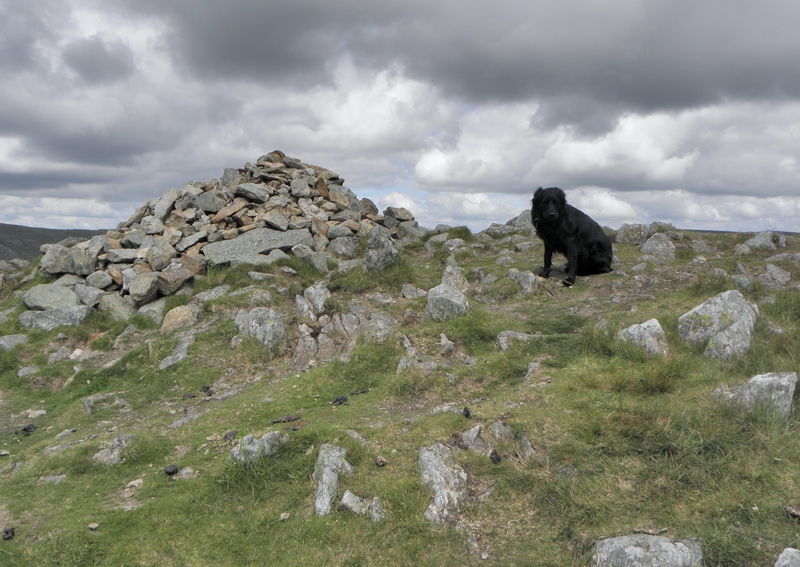 Return via Shipman Knotts, Kentmere Pike, and Harter Fell. 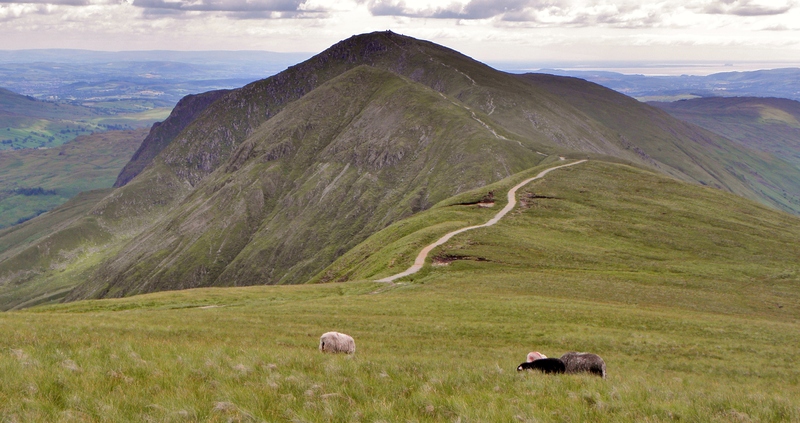 Such is its location, any walk that includes the summit of Froswick is likely to be breathtaking. Froswick is most readily reached from Kentmere or Troutbeck, both villages in the Windermere area of the Lakes. The fell can also be reached from the car park at the southern end of Haweswater (Mardale Head), reachable from Shap or Penrith; and from the Kirkstone Inn on the A592.